Hello to all on the A7/A10 Forum. I've had my '58 A10 for 30 years now, and for most of that I've made the poor thing lug around a Tilbrook chair made in Adelaide by my late Uncle Rex. The outfit has been off the road for 9 years but after a recent engine rebuild, I've just got it going again. My other bikes are a 51 Tilbrook ex-racer (Villiers 6E power) and a 85 Ducati MHR Mille. The Tilbrook car is the next project. Thanks to those who have already helped out with my technical questions! 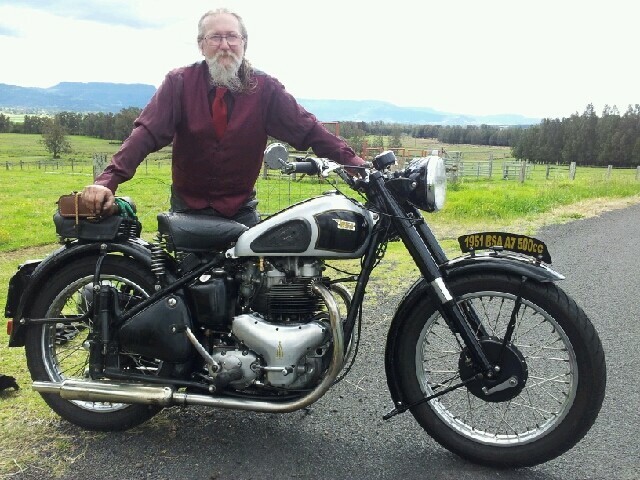 Thanks also to the BSA Club in Victoria for organising the recent International Rally. I had a great time at the rally and met some wonderful people. A special thank-you to Doug for the lend of his C12 as the A10 wasn't ready in time! Regards and Merry Christmas to all. Welcome aboard Tilly. Nice outfit, and swingarm frame A10, which is unusual, most were plunger or rigid. Lot of Ozzys on the forum now, are you in SA? Tillbrook sidecars; now there's a famous name! Welcome to the Forum, Tilly! Great machine ! Welcome to the forum. After 30 years of keeping the outfit on the road you may know more than some. Please share a story or 10. Chair pilots always have a few good ones. I should have said I'm now in Canberra but grew up in SA before I ran away to join the Air Force. I'll try to think of some intelligent musings on chairs apart from the obvious of brake around right hand corners and accelerate through left handers, and ride like you've got no brakes! To be honest, I would never had 'assembled' the outfit but for the family connection. Having done so though, it is a great ride for public events as it bring back a lot of memories for older folk, and kids love it.